Infant - $13.99 Only 2 left! Add black leggings or pants to complete the look! Which is nothing at all like your little one, right? They would never ever makes messes and never ever knock anything over, right? Oh really? You mean to tell us that they don't get into the garbage? That they don't chew on anything they can fit in their mouths? That they don't frequently climb furniture and enjoy wearing masks? Right, that's what we thought. Your little one shares a few more common traits with our favorite trundling trash rodent than you originally thought. Well perhaps it's time that your little impish kit gets to look like their equally impish spirit animal. 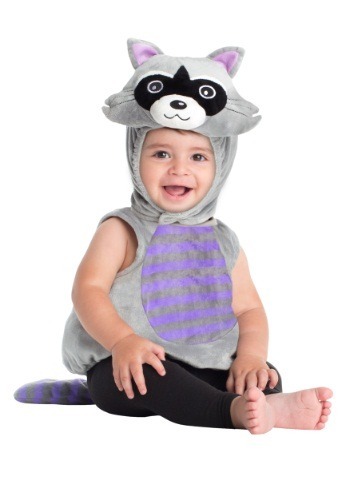 This Infant Raccoon Costume lets your little one look like a Raccoon while they continue their mischievous fun. This costume includes a fluffy body with purple tummy and detachable tail (which makes for easier get-aways). There's even a stuffed hood with raccoon ears, nose and mouth. Just bundle your little rascal up in this get-up and you can blame the mess in the living room on the local wildlife.